Not a small motorcycle but extremely functional. 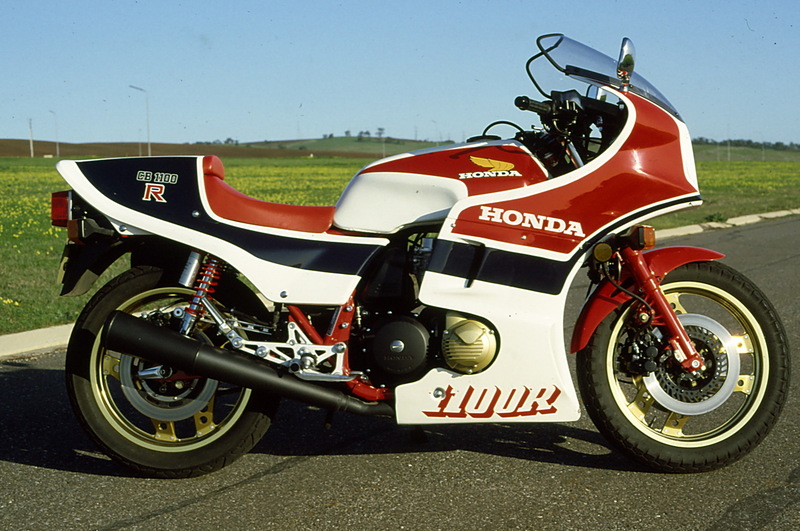 In 1982 the there was only one thing better for a Japanese motorcycle enthusiast to see than a Honda CB1100RC and that was more than one. In fact, it was the sight of five of the limited run, homologation specials, that greeted me on the forecourt of Trevena Honda at their Main North road dealership. 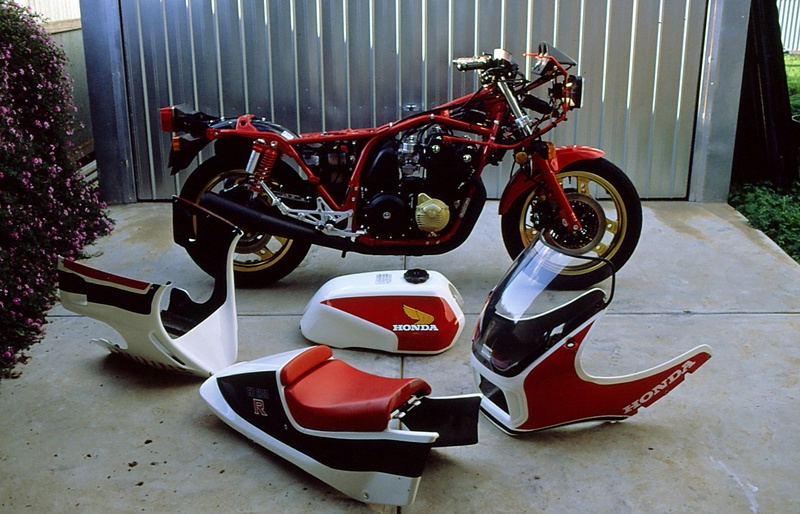 Only 200 of the RC model had been imported into Australia, and I was on a mission to secure one for myself. 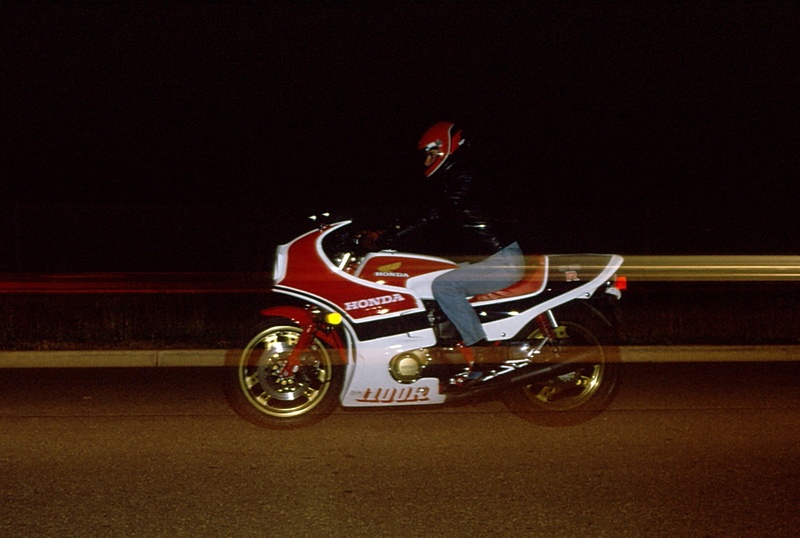 My current bike, at that time, was a 1979 Honda CB900FZ, the machine the RC was based on. It was in my opinion, a somewhat underrated motorcycle that boasted lightweight, good handling and attractive styling, yet it had been pushed into the background due to the capacity war being waged with the other Japanese manufacturers. The CB1100RC though was a different kettle of fish. Built primarily to redress the balance of power in production bike racing, it was not cheap. At $5,800 (Aus) it was almost twice the price of the CB900FZ it was based on, although this was tempered somewhat by the fact, that as a limited run special, it would hold its price and potentially appreciate in value. That first ride home on the RC was an interesting one as it was the first time I’d ridden a motorcycle with a full fairing. It proved to be quite effective at keeping the wind and weather off the rider although the hands were less well protected. The footpegs were set slightly higher and a bit more rearward pushing the rider’s knees into the alloy fuel tanks indentations. The adjustable handlebars (a similar system to Laverda’s) were in the dropped position giving a good “feel” from the front end. The brakes were highly effective causing the forks to compress considerably. The RC was physically a large machine, but it steered and changed direction with relative ease. Once at home it was time to indulge in the motorcyclist’s favourite pastime, making adjustments to the bike. The TRAC anti-dive system on the front forks was set at number one of its four positions, hence the accentuated nose-dive under brakes. This setting was changed to number three, and the air pressure in both forks was set to 25psi (between 23 to 27psi was recommended by Honda). 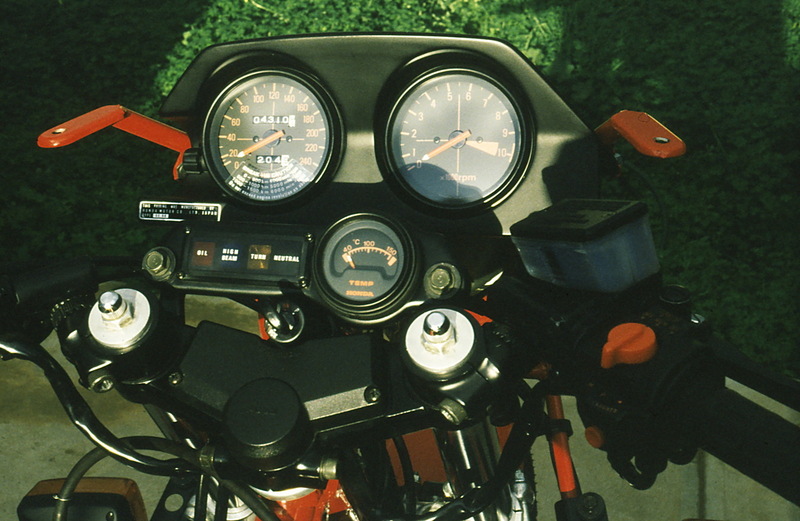 Air caps on the fork top and the engine oil temperature gauge with warning lights. The remote reservoir gas charged FVQ rear shockers had four compression, three extension damping settings and five spring preload settings. These were adjusted with the spring preload set to three, the compression damping to three and the rebound damping to two. The eighteen-inch wheels fitted to the RC sported 2.5inch front and 3.0inch rim rear widths respectively. Checking the standard fitment Japanese Dunlop F11 100/90 V18 and K527 130/80 V18 tyre pressures was another essential job. Next was to set the handlebars in the “flat” position. This was easily done by loosening the hexagonal through bolt enough to disengage the meshed “teeth” of the lower and upper part of the handlebar, so the upper bars could be tilted into the flat position, and then re-tightened. A quick run on a favourite stretch of road showed the suspension adjustments had firmed up the big Honda making it more responsive to rider input and the raised handlebars improved the comfort of the riding position. The owner’s manual was also very comprehensive and more of a condensed workshop manual, showing tolerances and recommended replacement of engine parts in racing kilometres/miles. The regular service schedule for normal road use was fairly standard, and the manual also quoted the CB1100RC as giving 115hp at 9,000rpm and 75kg-m at 7500rpm some 20hp up on the CB900FZ. All the usual service points on the RC were easily accessible for the home mechanic. The fairing lower took about five minutes to remove to reach the oil filter and cam chain tensioner, while the fuel tank had to be removed to gain access to the spark plugs and carburettors. The air filter was also easily accessible through the air-box side cover. 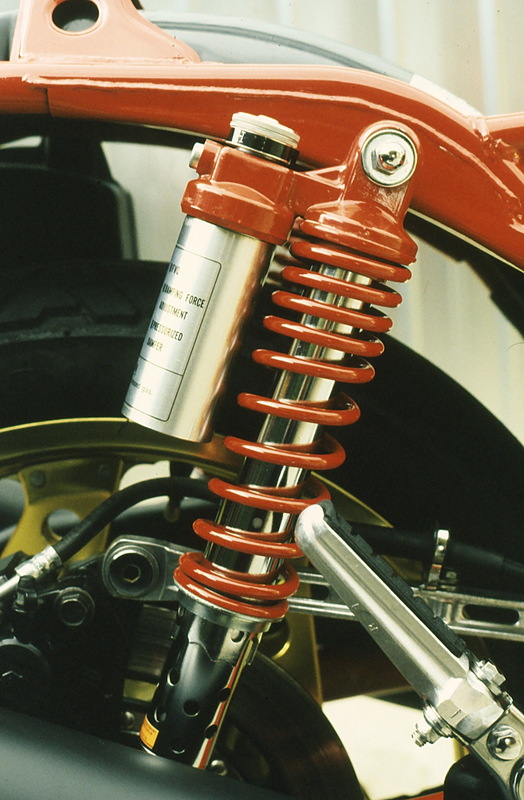 The RC was not fitted with a main-stand, but a rear paddock type stand was available from Honda dealers. Naked RC. It took about forty minutes to undress. It became apparent after running in the RC that this motorcycle could be used as a serious high-speed, long-distance sports tourer. On a favourite piece of road riding the CB900FZ at 120kmh was a comfortable rate of knots, but on the RC this seemed slow, and 140kmh was a comparative trot. The full fairing was doing its job with very little buffeting, even around the rider’s helmet. The power delivery of the 1062cc engine was quite linear, with a flat torque curve making hard acceleration deceptive with only a slight jump in power at higher revs. What did become apparent though was a vibration zone at around 4000-4500rpm that could be felt through the footpegs and handlebars, was more predominant through the large 26lt alloy fuel tank. This did eventually cause an internal baffle in the tank to break away which sounded like a buzz saw at these revs. Also, a baffle in the right-hand exhaust became loose and rattled. Both of these problems were fixed without question under warranty. The engine did smooth out considerably once out of this “zone”, although this did translate into higher illegal road speeds. FVQ gas charged remote reservoir shock absorbers. The only down sides that the RC did have was a restricted turning circle, thanks to the large fuel tank and fairing, but once this was factored in it never really became an issue. Also carrying a pillion passenger was really not a design prerequisite for the RC. The pillion part of the seat was higher, and the bulk of the weight of the passenger was behind the rear axle line of the motorcycle. This really didn’t help the handling of the RC regardless of the suspension settings. Although the front brakes were Honda’s very effective new twin-piston floating calipers that gripped 300mm ventilated disks, I opted to have the optional braided steel brake lines fitted. These were standard on the U.K. model and gave better initial bite and feel and were a worthwhile investment. The Honda’s presence on the road was also quite impressive. This was the first motorcycle I can remember that had car drivers change lanes to get out of the way. Other drivers would slow down just to see what sort of exotic piece of kit it was. Indeed the prominent fairing and bright colour scheme made the motorcycle quite visible to other road users, and it made the rider feel that little bit safer in traffic. What I didn’t expect was the reaction of other motorcyclists. In one instance I was told that it was a racer for the road and impractical for everyday use, and there was no way you could use all the power available. This was from a group of riders, one of whom rode a Laverda Jota! In reality, the Honda CB1100RC was a motorcycle you could commute to work on and use for weekend blasts through the hills. And for five years I did exactly that and enjoyed every minute of it. The RC’s engine performance was user-friendly, as was the superb handling in just about all conditions. It was a big and heavy bike, and after few hours of scratching on winding roads, the rider would know it. But this just added to the satisfaction of riding this type of motorcycle. The Honda was also a competent sports tourer that with the handlebars in the “flat” position was quite comfortable over long distances. Many of the specifications of the CB1100RC were carried over to the CB1100F with improvements (including rubber mounting the engine) that made it more civilised than its production-racing cousin. Unfortunately, the CB1100R series and CB1100F were also the last generations of big air-cooled four-cylinder bikes from Honda that along with other Japanese models quickly became dinosaurs in the fast-moving technological evolution of the performance motorcycle. Words Geoff Dawes (C) 2014. Photographs Geoff and Vivienne Dawes © 1982. This entry was posted in Motorcycle Racing, Motorcycling and tagged 1982, CB1100F, Honda CB1100RC, Honda CB900FZ on 08/01/2014 by Geoff Dawes.